Bangers and Mash are on the menu at the Trades Club as they celebrate May Day weekend with a feast of food, music and spoken word. The club has hooked up with the Hebden Bridge Food Festival’s sausage trail offering a range of tasty meat and vegetarian bangers on Sunday May 3rd from 6pm and all ingredients are organic and sourced locally. Once the tables have been cleared folk legends Leon Rosselson and Robb Johnson celebrate the bicentennial of Tom Paine. The radical thinker wrote The Rights of Man and The Age of Reason and the duo use a mix of key events from his long life and contemporary songs to reflect ideas that still influence progressive politics in this country. 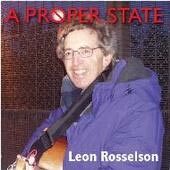 Leon Rosselton has been at the forefront of radical song writing for 50 years and Robb Johnson is widely recognised as of the finest songwriters working in the UK today being described as a ‘modern day Dostoyevsky’. The May Day celebrations kicks off on Thursday April 30th with Sally Weaver’s Rock the Valley night promoting the best young bands along the Calder Valley. Dead Orchestra hail from Halifax playing epic British epic rock and their debut EP was described as a ‘wonderfully overblown piece of pop infused aural drama.’ Support comes from electronica pioneers Window Right mixing jazz, afro-beat and Krautrock. Friday May 1st sees the welcome return of festival favourites the Baghdaddies with their high energy live show that always guarantees a sell out crowd at the club. The Baghdaddies play Balkan Gypsy with Middle Eastern flavours throwing in klezmer, tango, jazz and reggae with a touch of brass. The May Day weekend finished on Monday May 4th with two shows from Will Kaufman celebrating the life and songs of legendary protest singer Woody Guthrie. In the first show at 1.30pm Will sets Woody’s protest songs in the context of Depression era America and the 4pm show looks at how Guthrie condemned segregation and race hatred in song. “May Day weekend is really significant for the Trades and its members because we are a club that celebrates progressive values which all the acts support,” Trades Club spokesperson Paul Clark told the Hebden Bridge Web. “The Baghdaddies are one of our most popular acts so I’d recommend people book early to avoid disappointment and we’re delighted to welcome Leon Rosselton back to the club as he has spent 50 years promoting progressive politics challenging prejudice and hatred. Tickets for Sally Rocks the Valley (£4), Baghdaddies (£10), Sausage Trail (£5), Leon Rosselton and Robb Johnson (£10) and Will Kaufman (£3).